Daniel Lebovic received his M.D. from the University of Toronto Faculty of Medicine in 2002. His internship and residency in internal medicine were completed at Albert Einstein College of Medicine/Jacobi Medical Center in New York City. He went on to serve as chief medical resident and then moved to ... Read More Michigan in 2006 for fellowship training in Hematology and Oncology at the University of Michigan. After finishing his subspecialty training in 2009, he remained on faculty at the University of Michigan Division of Hematology-Oncology, earning the title of Clinical Assistant Professor. 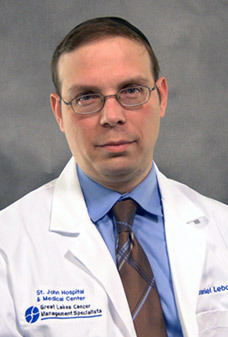 Dr. Lebovic is certified by the American Board of Internal Medicine in Hematology and Medical Oncology. He is a member of the American Society of Clinical Oncology and the American Society of Hematology. During his career, he has been extensively involved in clinical research and has served as lead investigator on many trials associated with important developments in the field of cancer therapeutics. He is an author on numerous peer-reviewed journal articles, and has presented his research findings at key international Hematology-Oncology meetings. Dr. Lebovic maintains a particular interest in training medical students, residents and fellows. He has lectured extensively to trainees at various levels of their medical careers. In addition, he serves as a core faculty member for the St. John Hematology-Oncology fellowship programs where he is intimately involved in the design and execution of the training curriculum. Dr. Lebovic is focused on providing oncology patients with the most up to date diagnostic and treatment options, while ensuring that patients and their family members are fully engaged in all aspects of their medical care. Daniel Lebovic, MD offers services at multiple MI locations.